Vogue patterns from the 1950s, ‘60s, and ‘70s never cease to amaze me. The intricacies of construction, the detailed instructions, and the artistic styling of so many of the patterns from those three decades make sewing from them such a pleasure. Each one is like a mini sewing lesson, neatly packaged with beautiful photos and/or sketches and precise line drawings. Such has been the Emilio Pucci Designer pattern on which I am currently working. 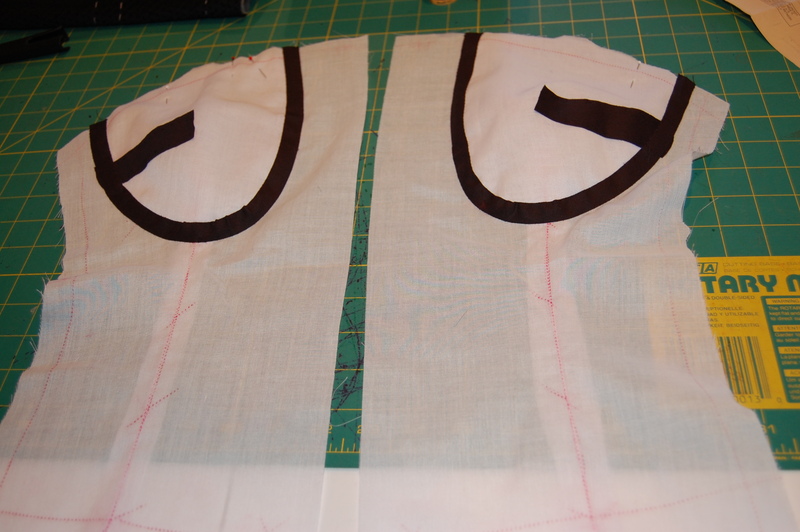 The unusual construction of the jacket caught my attention as I was trying to lay out its lining pattern pieces along with pattern pieces for the dress. As I mentioned before, the front of the jacket is cut on the bias. 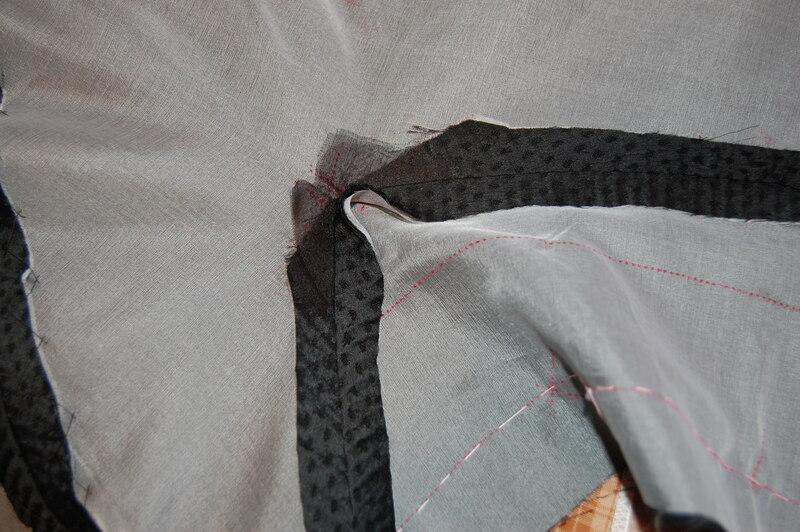 However the interfacing and the lining pieces for the front are cut on the straight of grain. How, I wondered, is that going to work? The answer to that question is one of the most fascinating construction methods I have ever come across. 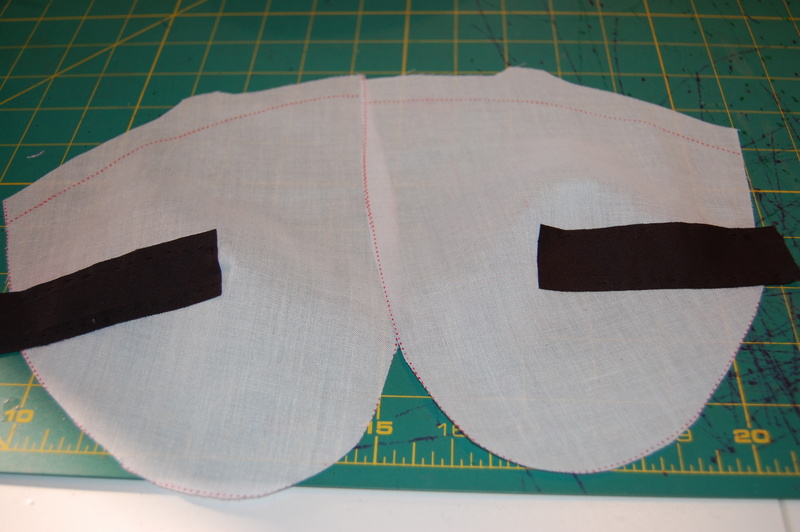 The interfacing and the lining both have deep darts to form the bust line. 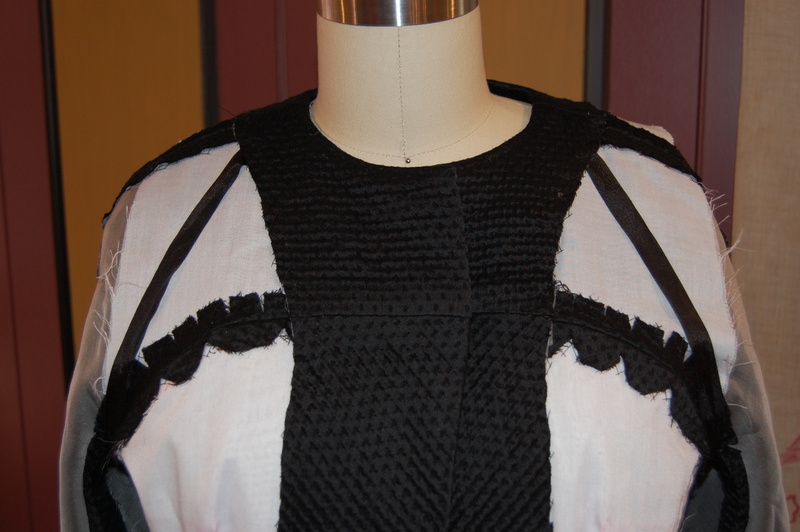 Of course, the jacket front, cut on the bias, is going to have built-in give for the bust. 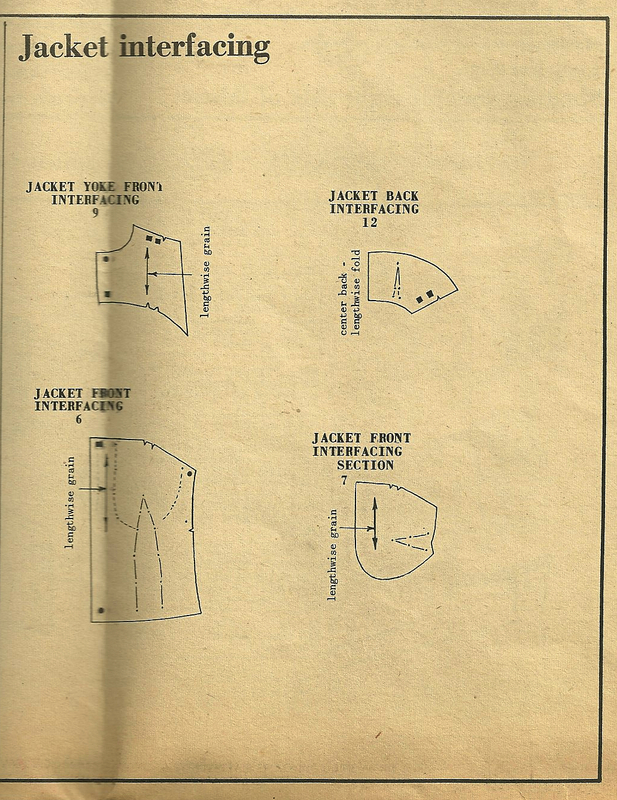 But in addition to that, there was a “cup-like” pattern piece for adding to the front interfacing, clearly with the goal of enhancing the bust line, and defining it. The “cup-like” pattern piece is in the lower right. Notice the large dart in the piece next to it. 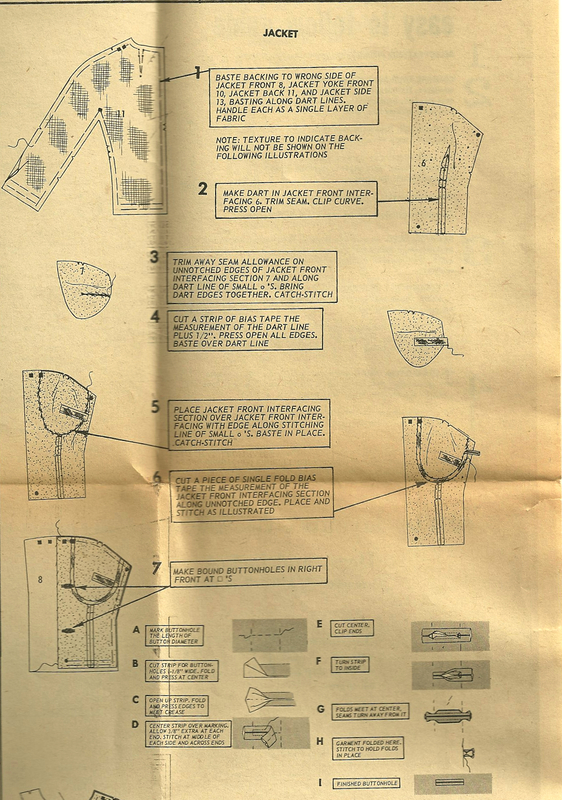 Here is the instruction page for assembling these interfacings. In effect, it is a process for making an interior bra. Click on the diagram to read it more easily. 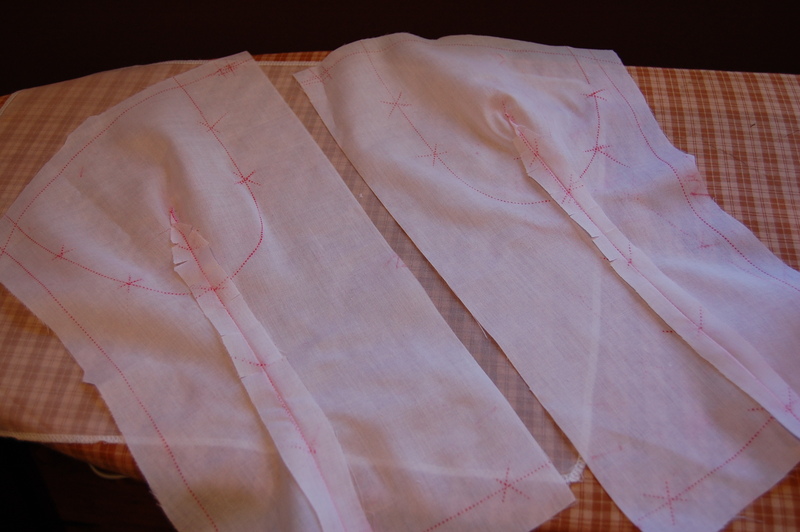 Here are my front interfacing pieces with the darts sewn. Here I am reinforcing the darts in the bust (cup) interfacings. Here they are ready to be added to the base interfacing pieces. And here are the front interfacings assembled and ready to be attached. Looks kind of risque, don’t you think? Note also the detailed instructions for making the bound buttonholes on the above instruction sheet. I did a practice run on a bound buttonhole, being careful to layer the fabrics exactly as they would be layered on the front of the jacket. 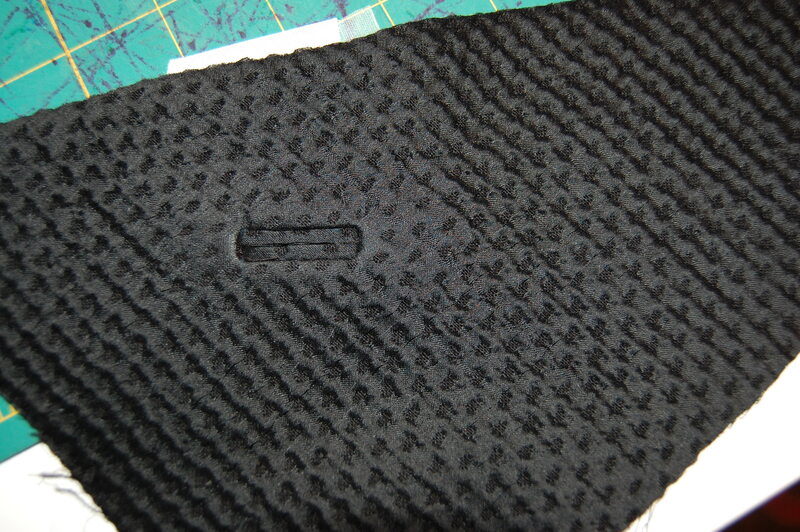 The right jacket front, marked for buttonhole placement. 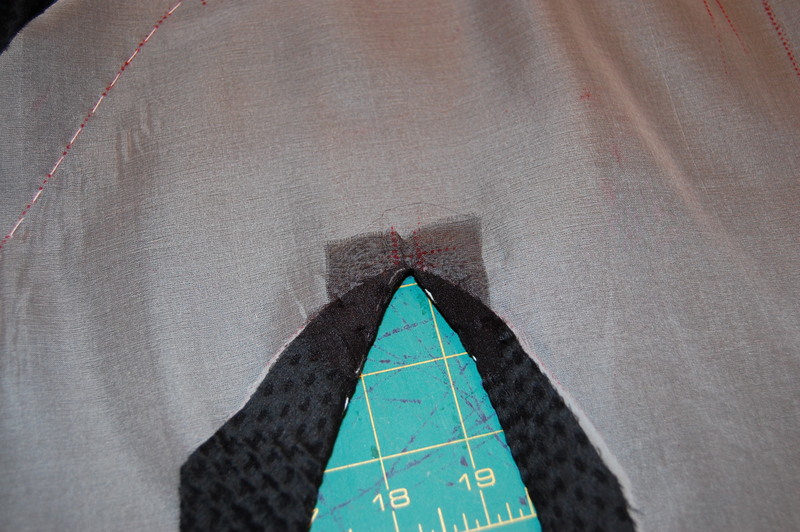 Another detailed instruction was given for the sharp angle under the sleeve. The instructions called for a 2” x 2” square of fabric to reinforce that corner. I used black organza. The organza patch is sewn on the right side of the jacket and pressed to the inside. 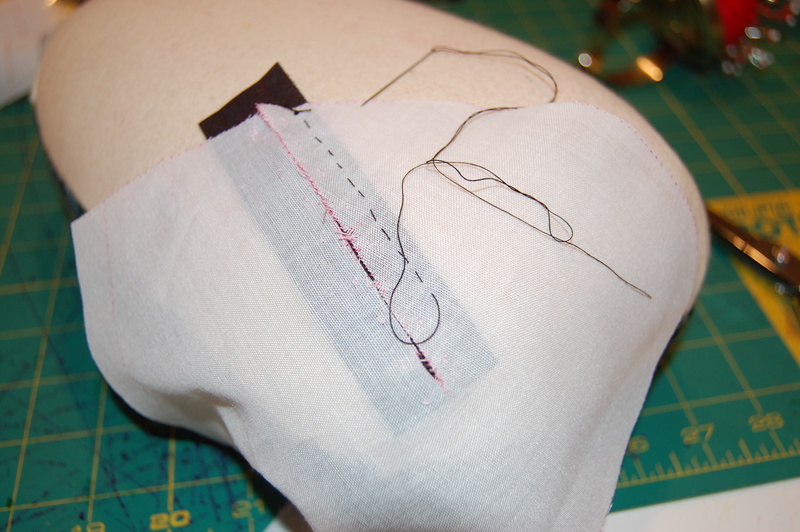 The organza patch makes a very secure and precisely sewn corner possible. 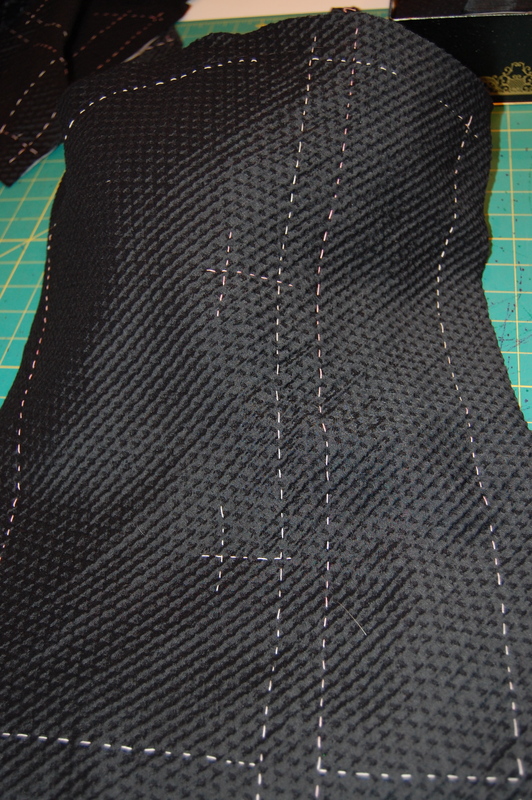 And here are just a couple of photos of the interior of the jacket with the rest of the interfacings attached. 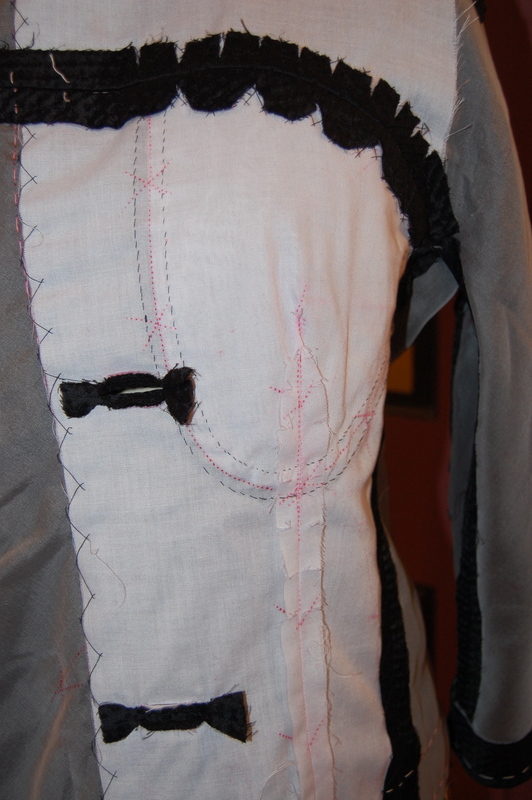 The right front of the jacket, with buttonholes sewn. Thje front of the jacket. Note the “stays” made out of seam binding. They are loose except where they are attached at the underarm and at the neckline. 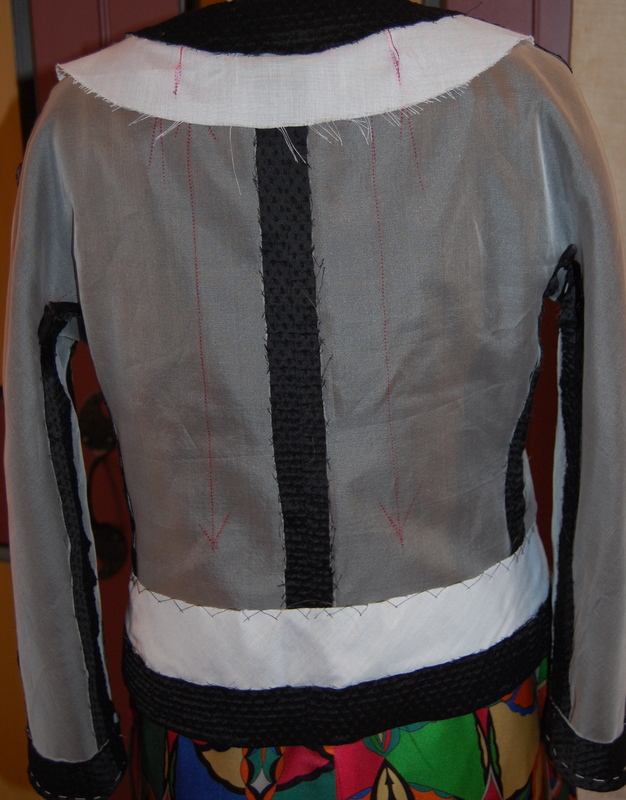 The back of the jacket – simple compared to the front! 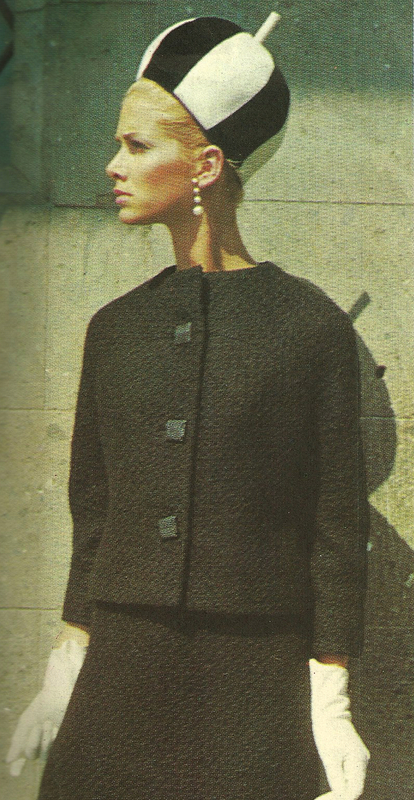 There is something else that never ceases to amaze me either about these sophisticated vintage Vogue patterns. That is – how stylish and current so many of them are. Here’s an example of what I mean. Take a look at these recent jackets from current designers. I clipped this out of The Wall Street Journal sometime within the past year, but I unfortunately forgot to note the date. Click on the photo for a close-up. The article rightly makes the reference to Balenciaga, but look how similar these are to the Pucci jacket on which I am working. 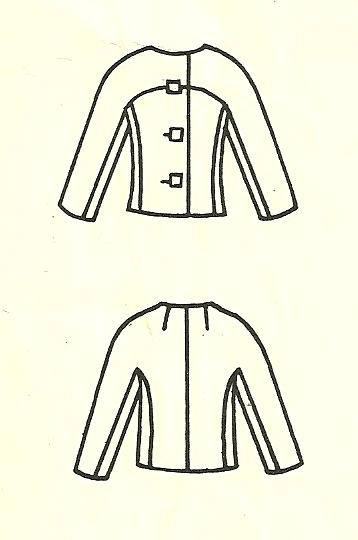 These thumbnail sketches also help to show the similarity to the current jackets. Wow! What an amazing pattern and wonderful construction instructions. I’m sure it is going to be a beautifully finished jacket! Thank you! This pattern has been so interesting to use that I just had to share some of the details! Fascinating! Thanks for the inside look at the construction details! You’re welcome, Brooke! So glad you’ve enjoyed the inside story. Thanks for sharing these construction details. This jacket will match your gorgeous dress so beautifully! Well, I do love a jacket and dress combo, and I’m excited about this one! I’m with Brooke. Thank you for showing us this couture construction. Wow! You are very welcome. Its great to share these details with people who find them interesting! 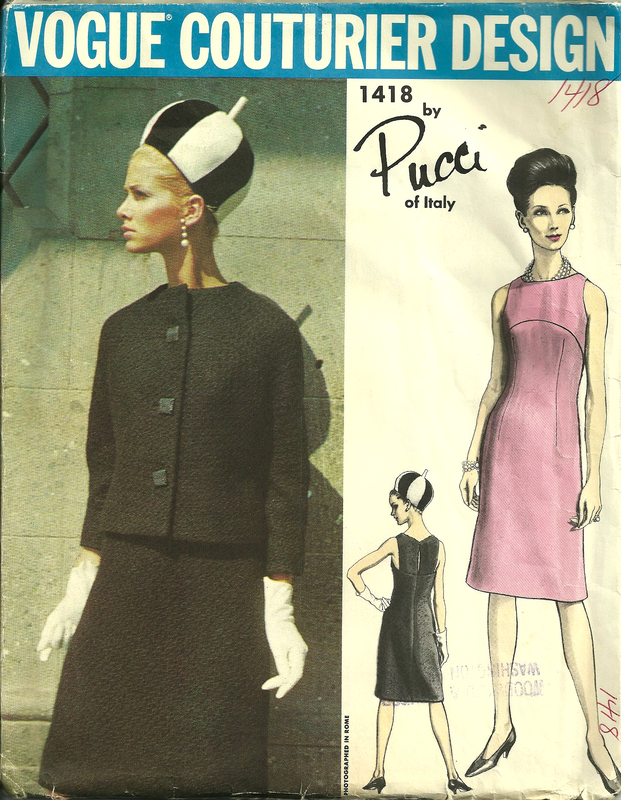 How great that the Pucci pattern includes detailed instructions for couture techniques, such as the corset structure in the jacket.. It makes a Chanel cardigan-style jacket appear simple, by comparison. Of course, you were successful in piecing the lining for the jacket sleeves. As for your secret, this project has been so filled with unexpected details, that I cannot even hazard a guess. In any case, I am very eager to see your finished garments. And you will see them both soon, for sure! It’s funny, at one point with this jacket, I had pieces all hanging together at odd angles, with loose ends flying every which way, and I was definitely reminded of the similarity with the construction of a Chanel-type jacket – sewing chaos! But – having made two Chanel-type cardigan jackets in the past, I can vouch for the fact that the Chanel-type jackets have a lot more work in them than this jacket. They are not more complicated, but they are much more labor-intensive. One of the things I love about this jacket is just how clever the construction is! Lord knows I love a jacket. This one has my name on it. Black and fitted. Yep. It’s mine. You should make one, Joanne! Or move next door, and we can share this one! Who would ever guess how complicated a simple-looking jacket can be?? It is going to be spectacular, very reminiscent of Balenciaga. Can’t wait to see it on you, with the stunning dress, of course. Oh yes, this jacket is kind of like an “effortless” dinner party – when done correctly it looks simple, but is anything but simple! And the jacket *looks* so simple! Looking forward to seeing the completed jacket. Le sigh. Such a shame the beautiful inner detailing gets left off these days for the ‘I want it now’ approach the pattern companies pander for. I love your comment about the ‘effortless dinner part’ – so apt! Those neckline to underarm stays are fascinating … thank you for showing so much of the interior construction work, all of which looks amazing. There is something quite magical about the clever, careful work that goes into intricate internal construction like this. “Effortless” it certainly isn’t but “magical” it undoubtedly is. Aren’t those ribbon stays interesting? They just kind of “float” inside the jacket, but add stability. I am fascinated by the interior construction work. It is beautiful. I have a question: I wonder what kind of fabric have you used for the interfacing. Is it 100% linnen? The jacket interfacing is a very lightweight jacket “canvas” which I believe is a blend of linen, cotton, and maybe viscose. It was very malleable. I needed something that would preserve the fluidity of the silk/wool blend of the fashion fabric, and this did the trick. Thank you for your interest!